Dr. Robert Hueter, Director of the Center for Shark Research, Mote Marine Laboratory. The Guy Harvey Ocean Foundation (GHOF)is teaching children the importance of sharks in the marine world. 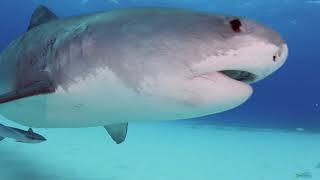 The GHOF began today (Thursday 10 September) its series “Shark Talk” for students. It is a culmination of information found over years of shark research work and includes documentary screenings and question and answer sessions between students and a team of shark researchers. The scientists say the three day educational forum is their way of creating a generation who will understand the importance of sharks in the environment.